Why would anyone spend a lot of money to restore something which has a market value less than the restoration cost when completed? For me the reason was a lot of sentiment and nostalgia, so I have a 2-door Austin Big Seven 'Forlite', first registered at Croydon BC on 31 May 1938, on the road. Towards the end of September 1947 my maternal grandfather, Albert Harrison, took me with him when he went to look at a car. We walked down Church Road, Bexleyheath, crossed the Broadway to a display of second-hand cars and went to the last one on the left; could I forget the distinctive registration mark? A man came out of the garden shed type office and spoke with Grandfather. I don’t recall him taking the car for a test-drive but looking back he may have already seen the car and this visit was to finalise the purchase. Evidently it was private purchase as the original handwritten receipt shows that Grandfather purchased the car on 27 September 1947 for £280, the car had cost £137 new in 1938, (see note 1 below) from Charles Dunk, a Director of McDowell's Ltd, George and King Streets, Sydney, NSW, Australia, who was working in London. 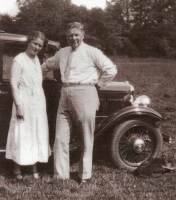 Grandfather had owned cars since the1920’s, many Wolseys, Singers and a few Austins, including at 10/4 in about 1934 (photo below), as he was one of the few men at the time who required a car for work. He used his pre-war cars and the Big Seven daily for his work as a Buildings Inspector with the Ministry of Works, visiting many post-war housing developments around Surrey and South London until he retired, aged 70 years, in September 1952. Whilst several family photographs exist of him with some of his previous cars none show him with the Big Seven. During school holidays he took me for days out with him when going about his work, making me sit on a cushion in the front passenger seat and reach forward to hold the glove compartment with my left hand so that he could see that I was not touching the door chain and might inadvertently open the door. As the n/s semaphore arm was always sticking I was often asked to thump the door pillar to activate it, resulting in a tiny sore fist by the end of the day, but he could reach across and do it himself. It still sticks to this day despite several attempts to make it work properly. I also used to remove the seats about every six months, lay them on a WD blanket, and top-up the ‘float-on-air’ seat cushions using the tyre pump. My grandmother, Beatrice, was from Helston, Cornwall but had lived at Clapham Common, SW London from the age of sixteen and married in 1911. After moving around the UK with Albert’s work in the building trade they moved from Clapham Common to Bexleyheath, Kent amongst the fruit farms in 1930. In those days men were allowed two weeks paid holiday each year and so for many years they travelled from Clapham Common, and later Bexleyheath, to Helston to visit Grandmother's family for a week. Always leaving home about 4.00 am the journey was across south London to stop near Guildford for breakfast. Then going via Basingstoke and the A30 to stop at Shaftesbury for lunch, on to Okehampton to stop for tea, arriving at The Angel Hotel, Helston about 10.00 pm. A journey of about 335 miles taking 18 hours, the first 50 miles in 2½ hours, then three 90 to 95 mile stints each of 3½ to 4 hours. Stops, at hotels with a garage business alongside, for up to 1½ hours were necessary, not only for driver and passenger meals and general comfort, but to allow the engine to cool and an attendant would check the engine oil and water, and refuel, no doubt given a 1/- tip. They also travelled each year to Rugeley, Staffordshire along the A5 from London to visit Albert's family, a journey of about 160 miles with a stop at Towcester. After Albert's death in 1954 his daughter, my mother, Beatrice Castle, used the car for weekly shopping trips with her Mother until 1971 when it required a de-coke and the pistons and rings had to be replaced. By this time the bodywork was showing signs of deterioration, the upholstery was in very poor condition and with Grandmother becoming infirm the car was no longer required for the shopping trips. I was not in a position to restore the car, not having the skills, and with a young family neither the money nor the time with my professional life so the car was stored in the garage amongst all the other things that are stored in garages. During that time I turned the engine by hand each month and kept the tyres inflated but that did not prevent ageing of the tyre walls. Thirty years passed. With several trips each year to Helston, after my Mother had moved there in 1975, we often saw the historic vehicles gathering on August Bank Holiday Sunday for the GWR Anniversary Run from Helston to the Lizard (see note 2 below). In August 2001 I realised that the Centennial Run would be held in 2003 and that our grandson, Dominic, would then be a month or so short of his 5th birthday; we could re-enact the first trip that I had made with my Grandfather before I was 5 years old, so that event became the deadline for restoration. I contacted a local Austin Seven enthusiast and was introduced to a garage owner who had restored several cars to a good standard, and so the work was placed with him with July 2003 as the final deadline. The bodywork, chassis, engine, transmission, steering and suspension are original except for parts replaced during normal wear and tear. The bodywork required repair to the front floor-pan, the sills, the rear edges of the front wings and the front edges of the rear wings, the rear offside corner and the box forming the rear boot. The paint work was stripped and re-sprayed and the coachline repainted by hand; with wing piping, body rubbers and bonnet tape renewed. The chassis required cleaning and, with the body underside, was given new anti-corrosion protection. The engine was completely stripped, cleaned and rebuilt with 10 thou. regrind of the crankshaft, a new water manifold and stainless steel exhaust system. The new leather upholstery and interior panels are as near to the original green colour as possible, with foam replacing the Moseley 'Float-on-Air' seat interiors. A new head lining was fitted and the original rubber matting replaced by wool carpeting. Bumpers and small items, including the door handles, were re-chromed. New Firestone cross-ply tyres and inner tubes were fitted. The original 6v system has been retained but the original cloth-covered wiring loom was replaced. The headlamps were converted, replacing the moving solenoid system, and re-wired to make the offside lamp remain lit with a dipped beam. The additional stop/tail lights had been fitted on the rear wings in 1960 so that the car complied with the UK MoT requirements. I fitted flashing indicators so that modern motorists can see, and understand, a signal for change of direction; also a rear fog warning lamp and retro-reflectors. Despite some delays the majority of the restoration was completed and the car passed the MoT test; it was on the road again on Wednesday 20 August 2003 with the GWR Anniversary Run on the Sunday, 24 August. A bit too close to the deadline and barely time to get used to driving it; but the car was back on the road with a genuine 53252 miles on the 'clock' since new. That week we had made contact with the Cornwall Austin Seven Club, recognising the benefits of a special interest club; the intention was now to use the car in order to preserve it, and our first Club event was the 'End of Year Run' on 31 December. It was April 2004 when we were able to move to Helston and the car was used regularly on monthly Club runs, and supporting a few summer shows, throughout Cornwall for about 10 years, averaging 1200 miles per year. Due to declining health we can no longer manage club runs but support a few local summer shows each year. We are able to take our grandchildren with us to a few events each year; they greatly enjoy it so we hope that one of them may wish to keep the car on the road at some time in the future. How many children can say that they go for outings in what was once their great-great-grandfather's car! I can manage the pre-run checks and regular servicing at 3 monthly intervals, about 300 miles as stated in the handbook. However, having no real mechanical skills, a lack of tools and facilities I confess to relying heavily on some great friends in CA7C for repairs, without whom the car would no longer be on the road. The original road fund licence holder, and early insurance documents, show that the new car was supplied by Tankard & Smith Ltd of Peckham Road, Herne Hill but I do not have any documentation nor the details of the owner(s) before Charles Dunk. When I contacted DVLA to see if it was possible to find out who the owners were before 1947 I was told they only hold records from when the Agency was established in 1972 and succeeded the County and County Borough Licensing Departments. A few of them have surviving archives (see note 3 below). Unfortunately both Croydon Borough Council, where the car was first registered, and Kent County Council, which retained the original buff Registration Book in 1951, are amongst the many Licensing Departments which destroyed all records after DVLA was established. 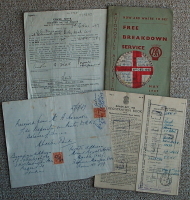 As well as the original receipt for the deposit of £20 and the balance of £260, I have Albert’s first cover note; the full years Comprehensive Insurance Certificate from May 1948 issued by the original dealership as insurance agent; the 1947 tax disc and the second buff registration book as the first one issued was retained by Kent County Council Licensing Department in 1951. I also have the original 'Big Seven' Handbook, Publication 1523D, and AA Members Handbook for 1947. Also the original radiator muff for cold weather motoring; the starting handle, stored under the bonnet, and ignition key. The original tool roll is badly worn and no longer used. Sparking plug and tappet clearance gauge. It is interesting to look at the costs associated with motoring when my Grandfather bought the car. 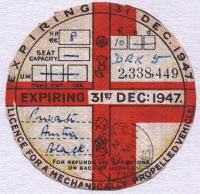 The annual motor vehicle licence was £10, or £3 13s 0d (£3-65) for four months. His comprehensive insurance, including professional use, was £11 16s 6d (£11-82) for the year. Petrol cost 2s 1½d (10.62p) per gallon (2.28p/litre), with duty at 9d (3.75p) per gallon (0.82p/litre). There was only one grade, known as "Pool" petrol, equivalent to 74 octane. Castrol XL30 engine oil, used in winter, and XL40, used in summer, cost 1s 3½d (6.45p) per pint (11.36p/litre). All garages provided a 'front of garage' service. The car was parked at the roadside whilst the delivery hose was swung out over the pavement, the attendant operating the wind-up pump took several minutes to "fill her up" with a few gallons, often with the last fuel erupting from the filler tube to spill onto the ground! He would also offer to check the engine oil and water. Inevitably the engine required oil and so a full pint was poured into a jug, but not all was used, although charged for! The attendant would also clean the windscreen and so he was often given a reasonable tip by the driver who had not had to get out of the car. The driving licence cost 5/- (25p) and was renewed annually. Grandfather was one of the many drivers had not taken a driving test having held a driving licence before 1 April 1934. Under the Road Traffic Act 1934 anyone who bought a licence after that date had to take a driving test but these did not commence until 13 March 1934 when they were voluntary, and then becoming compulsory on 1 June 1934. Annual Membership of the Automobile Association was £2 2s 0d (£2-10) for free roadside breakdown service. If the breakdown was the result of an accident, or trouble occurred at the member's home, free service was not available. Under test conditions the Big Seven 'Forlite' had an overall fuel consumption of 40 mpg. Top speed was nearly 55 mph with acceleration from 0 - 30 mph in 10.7 secs and 0 - 50 in 37.9 secs through the gears. (Practical Motorist 'Road Tests of New Cars' - July 16th 1938 pp 424-427). In current use the performance is much the same, although top speed is kept to about 45 - 48mph, fuel consumption is about 40 mpg, no doubt nearer 35 mpg on Club runs with much use of low gears on the steep hills and narrow, twisty, lanes. Austin Big Seven 'Forlite' Saloon; Registration mark: DRK 5; Manufactured: May 1938 at Longbridge; First registered: 31 May 1938 at Croydon Borough Council, Surrey. Car No: CRW 10979; Chassis No: 10979; Engine No: 1A 10956; Engine capacity: 900cc; RAC Engine rating: 7.99 hp; Develops: 25 bhp at 4,000 rpm. About 8000 'Forlite' saloons were built between March 1938 and January 1939 and 128 are known to exist worldwide (see A7CA Surviving Chassis Register). Note 1: New car production was very limited during World War II as the manufacturers mainly supplied military vehicles. Many cars were destroyed by enemy action, and a lot of badly damaged cars brought out from the rubble of bombed buildings were turned into Specials. Car production did not restart until 1947 at the earliest and as the UK Government controlled the steel industry, car manufacturers were only supplied with steel provided that 75% of output was exported, an effort to recoup funds after the costs of the war. Therefore, with new cars very scarce until the early 1950s, pre-owned cars in good condition were at a premium, hence the high price paid by Grandfather in 1947, even two years after the war had ended. Note 2: The GWR Run, which has been held annually on August Bank Holiday Sunday for over 25 years, commemorates the first bus service, run by the Western National Omnibus Co., from Helston Great Western Railway Station to The Lizard on 17 August 1903. Other versions of this article, by Doug Castle, have appeared in Focus, October 2003 pp7-9; Magazine of the Austin Seven Clubs' Association 2005D pp29-31; North-Cornwall Advertiser & Mid-Cornwall Advertiser February 2006.